Sheriff's Investigator Charlie Wilder speaks to members of the Bradyville Community Watch Saturday. Criminals can strike anywhere, including small rural communities. That was one of the messages Cannon County Sheriff's Chief Investigator Charlie Wilder delivered Saturday evening. Wilder was the guest speaker at the Fall/Winter Meeting of the Bradyville Neighborhood Watch, held at the Bradyville Church of Christ. Among the crimes Wilder cautioned listeners to be aware of is mail scams, which usually involve a fraudulent company sending people bogus checks. After the recipient cases the check, and sends the company processing fees, they later discover the check was a fake and they lose not only the money they thought they had received, but also the money they sent to the fake business. 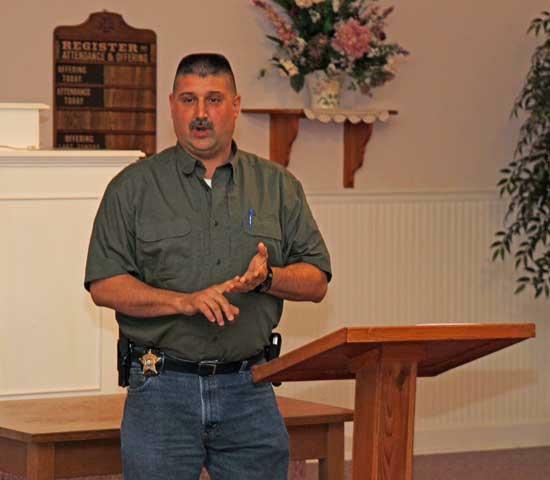 See the Dec. 8 issue of the Cannon Courier for a full report on Detective Wilder's presentation.